What’s a good way to gear up for the pressures of the Stanley Cup Playoffs? 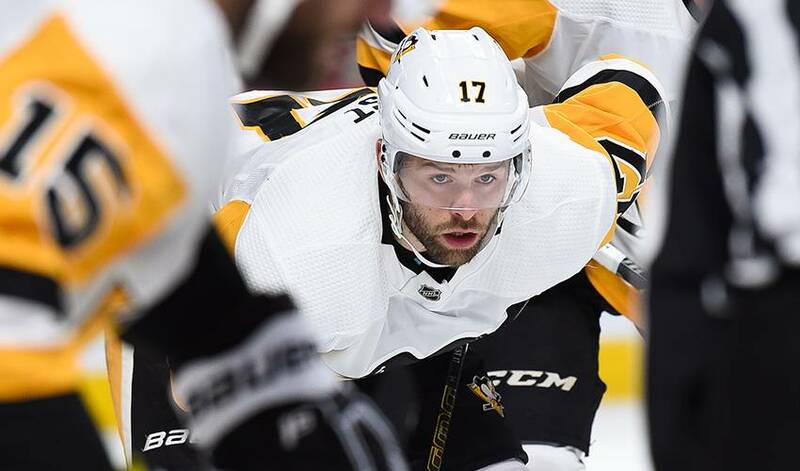 For Bryan Rust, it’s binge watching a wildly popular, Emmy Award-winning HBO series. On a Sunday afternoon in Pittsburgh, three days before the Penguins take on the New York Islanders in Game 1 of their Eastern Conference First Round series, Rust and his fiancée, Kelsey Burton, are enjoying a quiet day together. After a regular season that yielded a career-best 18 goals, the Michigan native will zone-in on the task at hand, specifically, looking to help the Penguins get by an upstart Islanders side that recorded 103 points in 2018-19. Selected by Pittsburgh in the third round (80th overall) in the 2010 NHL Draft, Rust won’t be making any tweaks to his mental approach in the post-season. And in doing whatever it takes to get the win. With 16 goals, including four game-winning tallies, in 58 career playoff games, Rust has stepped up with some timely post-season offensive contributions. But it’s not just about putting up points for the right wing who spent four seasons at Notre Dame, winning the team's Unsung Hero Award as a senior. NHLPA.com caught up with the right-winger to chat about what he’s most grateful for, including what those hockey memories have taught him. As Pittsburgh Penguins defenceman Jamie Oleksiak goes through the exactitude of his offseason training routine, he often draws inspiration from the youngest member of his athletic family.